What is considered to be creative work? Is creative work always recognizable as in artistic work, or is it something where inventions come into being, or simply any task at hand? How does creativity construct individual identity, especially work identity? 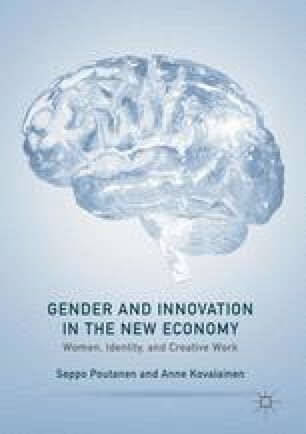 And how does gender become defined in creative work leading to innovations? Creativity is in some ways surely part of every work task and its performance, from even the most repetitive and standardized job tasks to the most unpredictable problem solving and unique artistic performances. Given this wide definition, the value and importance of creative work in the contemporary economy is omnipresent. This concerns the gendered nature of creative work in relation to innovations also: the technological solutions we have discussed in earlier chapters, from the washing machine to the fitness and wearable technologies, show how embedded creativity is in the innovation, design and production of material and immaterial goods and services. This chapter examines the complexities of gender, technology, care and creativity in contemporary work and economy. Ashcraft, C., & Blithe, S. (2010) Women in IT: The Facts. National Center for Women & Information Technology, ncwit.org. Department for Culture, Media and Sport (2016) Creative industries economic estimates January 2016 – key findings. www.gov.uk/government/publications/creative-industries-economic-estimates-january-2016. Retrieved 12.8.2016. Esplen, E. (2009) Gender and Care. Overview Report. Bridge, IDS. http://www.bridge.ids.ac.uk/. Retrieved 15.6.2016. FHI (2016) Future Health Index 2016. The capacity to care. Measuring perceptions of accessibility and integration of healthcare systems, and adoption of connected healthcare. Retrieved 17.9.2016 from: https://www.futurehealthindex.com/report/2016/. HIMSS Analytics (2016) 2016 Telemedicine Study. April 2016. Retrieved from: http://www.himssanalytics.org/research/hmss-analytics-essentials-brief-2016-telemedicine-study. 12.10.2016. Higgs, P., Cunningham, S., & Pagan, J., (2007a) Australia’s creative economy: Basic evidence on size, growth, income and employment. Technical Report. Brisbane: Faculty Research Office, CCI. http://eprints.qut.edu.au/archive/00008241/. Higgs, P., Cunningham, S., & Pagan, J., (2007b) Australia’s creative economy: Definitions of the segments and sectors. Technical Report. Brisbane: Faculty Research Office, CCI. http://eprints.qut.edu.au/archive/00008242/. OECD (2007) Immigrant health workers in OECD countries in the broader context of highly skilled migration. Paris: OECD. http://www.who.int/hrh/migration/2007_annual_report_international_migration.pdf Retrieved 12 September 2015. Ramirez, E. (2013) How to download Fitbit data using Google spreadsheets: an update. At quantifiedself.com. Retrieved 15.7.2016. Sleeman, C. (2016) Where do creatives cluster? The Long+Short, 1 Feb. 2016. http.thelongandshort.org/creativity/where-do-creatives-cluster. Retrieved 15.8.2016.